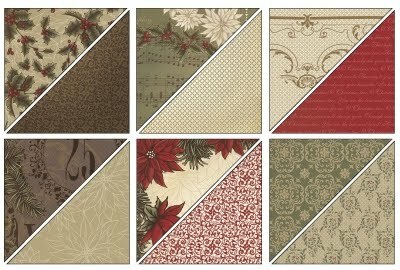 November Starter Kit incentive - Embellishments!!! I happen to think that this is a super-duper time to buy one of Stampin' Up! 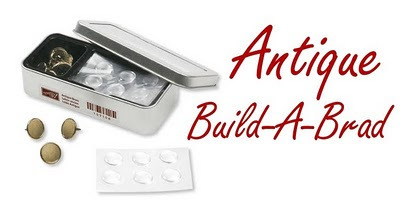 's Starter Kits -- get all that lovely product before the holidays, receive a great discount that you can use right away on all the stamping goodies you want, and fabulous demo-only perks as well. To help make the already great kit even MORE appealing... I've put together a fun embellishment bundle worth over $50 in value to give to anyone who orders their kit through me in either November or December!!! Now, this offer is only available through me and is valid for anyone living in Canada who orders either the Standard or the Digital Starter kit, each only $215. If you have any questions about Stampin' Up! and the demonstrator Starter kits, drop me an email. If you're ready to order yours, just go HERE and use the password CANADA to order your kit! 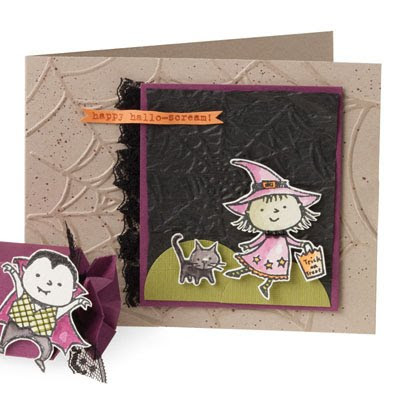 This be-witching card is the perfect Halloween greeting for a charming young lady in your life! A happy little witch and her cute black cat are chipper little messengers for a unique hello. Creepy crawly textured web backgrounds created using our Spider Web Textured Impressions Embossing Folder give this card a mesmerizing depth and dimension right out of the twilight zone. Invite some creepy crawly guests to your home this Halloween season by making it an alluring lair with our Spooky Things Décor Elements. 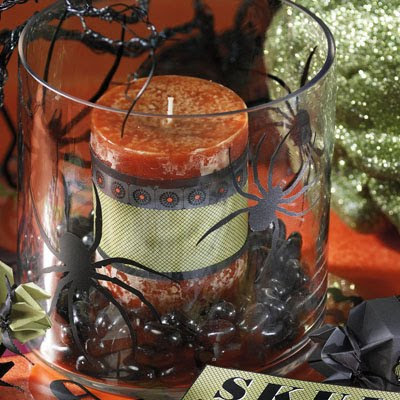 This eerie candle centerpiece decorated with our Nite Owl Designer Series Paper and venomous-looking vinyl spiders will definitely create a cozy atmosphere for all kinds of fiendishly fun friends, including trick-or-treaters on the big night. 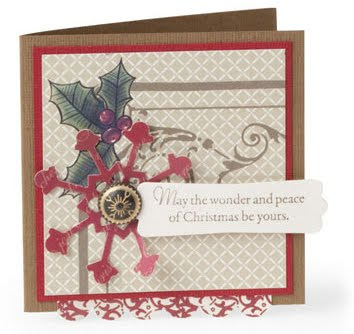 Holiday card classes on Saturday and Monday! Be sure to join me this Saturday or Monday for our Holiday card camp, featuring the beautiful Deck the Halls Designer series of paper! You'll be making 10 different cards with matching envelopes, giving you a heads up on your Holiday card crafting this year. Cost is $45 per person, or free with a $100 order placed that day. Please RSVP with your time preference and hope to see you there! Yes folks, I'm now officially back in the studio today after being away for the Creativ Festival and then stuck at home with a sick child. You can imagine the disaster my studio presented to me when I walked in the door --- I felt like turning around and running home! ACK! To further expound on the scary theme, I'll be presenting some sweet & spooky Halloween ideas for the rest of the week! 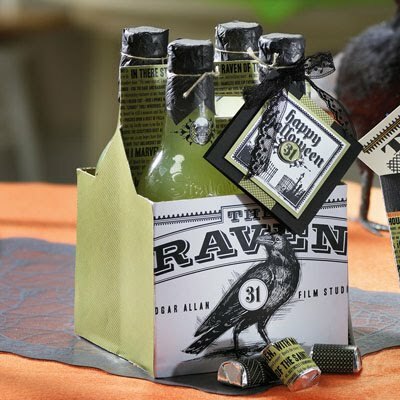 If you are bringing an extra tricky treat to the Halloween party, our Nite Owl Designer Series Paper is the perfect solution for transforming product packaging from ordinary to extraordinarily spooky. Black Waffle Paper and Linen Thread top our bottles nicely for a grim effect, almost as if to warn that this beverage isn’t for everyone! so I'm letting Stampin' Up! entertain you this week with their beautiful artwork! A warm, glowing fireside bedecked with the décor of Christmas is just the thing to take the edge off a day spent shopping for gifts in the winter chill. 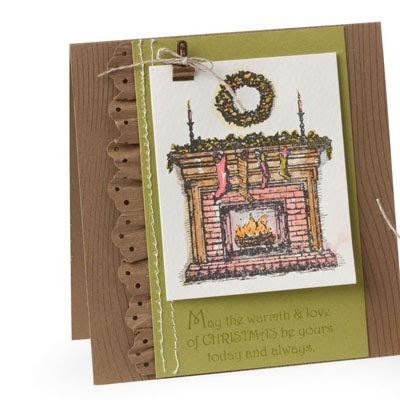 This card radiates the warmth and love of Christmas with its cozy scene and message. Its ruffled eyelet border and sewn accents add to its down home appeal, evoking all the comforts of being home with family and loved ones during the holidays. My studio is closed today as I am exhibiting and teaching classes at the Creativ Festival this weekend, so I'm letting Stampin' Up! entertain you this week with their beautiful artwork! 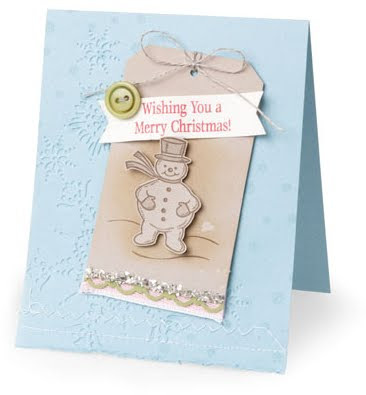 The mesmerizing texture of enchanting snowflakes, a jolly snowman friend, and a touch of sparkly Silver Glass Glitter on this card give all the right hints of the magic of Christmas. Make one to give to a special young one in your life to keep their Christmas dreams and memories alive in their hearts for always. Bring the warmth, cheeriness, peace, and all other special feelings of Christmas to the hands and hearts of your family and close friends with our fun and festive images and greetings of the season. Brads make great berries on this holiday tag. Try using them in unique ways to enhance your next project! My studio has been taken apart as I set up our booth today the Creativ Festival and teach the "Cards for the Holidays" class, so I'm letting Stampin' Up! entertain you this week with their beautiful artwork! 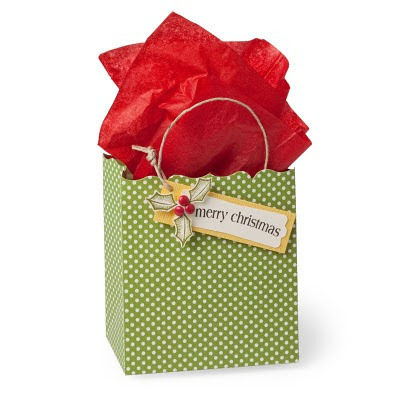 Send a small but charming wish of Christmas spirit to a friend with this quick and easy notecard. Made mostly using our Deck the Halls Designer Series Paper, it combines a favorite icon of winter, the snowflake, with traditional holly and berries and a vintage gold background and flourish.